← Does ERP Hold Back Lean Six Sigma in Plants? Do societies with freedom of the press have any particular advantage when it comes to fostering long-lasting, high performance businesses (strong, long-term results coming from strong skills and superior processes)? I exclude from this question multi-nationals that have, for better or worse, moved into countries with little or no free press (such as a McDonald’s or a Walmart) or companies that source raw materials of components. Similarly I exclude organizations with large profits due to state-sanctioned monopolies and favoritism as these results are not necessarily the result of world-beating competence. For example, although Apple sources components from China, it is the quintessential American firm. The question is whether the relative freedoms of the press, and citizens, in America is a necessary element of a company like Apple coming into being and growing into the success that it is. As performance improvement professionals, we typically accept as a given the axiom that to improve an organization requires a minimum level of transparency and fact-based decision-making. Deming emphasized the need to “drive out fear” and arguably there is somewhat of a case that an organization might find it more difficult to establish a free-from-fear organizational culture if it and the employees within it were born, raised, and live within a relatively repressive society. On the other hand, has the growth and power of commercial enterprises become such that they represent their own micro cultures, able to create progressive climates within the four walls of their company even as the society around them is less transparent and perhaps wary of authority? Or perhaps citizens are able to adjust to the practical realities of life in a relatively controlled civic environment while at the same time acting more freely as they pursue their commercial interests? 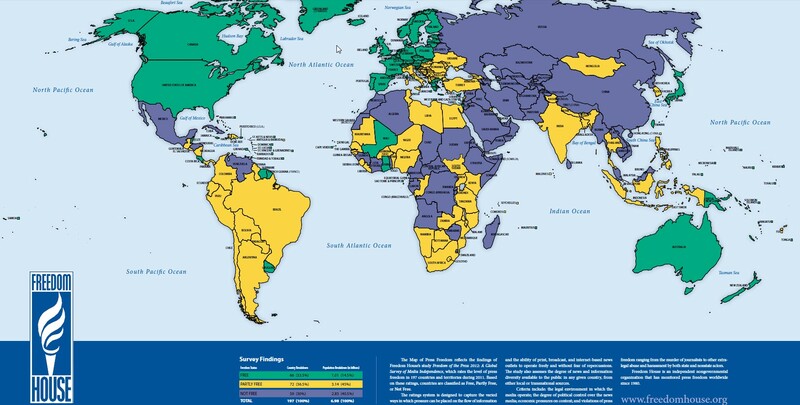 In any case, the NGO Freedom House has released its 2012 Report on World Freedom of the Press. The report and methodology are found here: http://www.freedomhouse.org/reports. The rest of the relatively free press are in the table below. As for the question posed above, obviously a free press is not apparently a pre-requisite for producing a high performing company. South Korea has several world-class firms as does India, Brazil and others. Lowly Japan (in their ranking that is) is home to Toyota, perhaps the poster child for long-term competences. Although Greece and Israel were given the same press freedom scores, Israel is home to many successful high-tech firms whereas the same cannot be said of Greece. 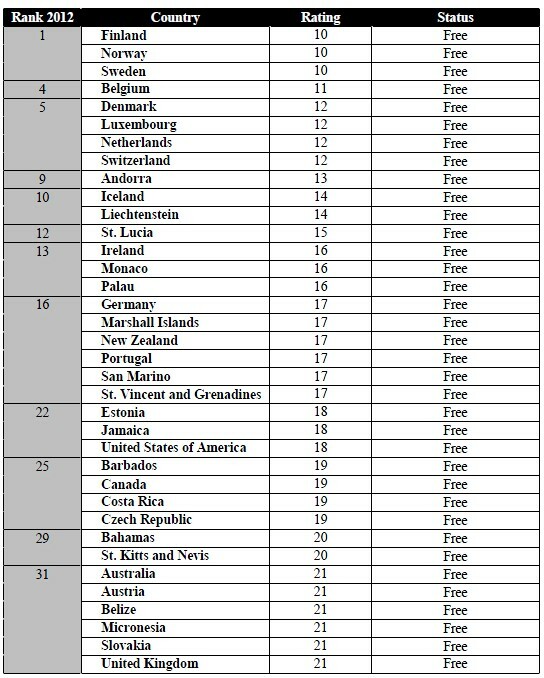 Conversely none of the countries scoring high on Freedom of Press necessarily has a lock on world-beating companies born and raised within their borders. If we plotted some relatively long measure of company performance, such as total return to shareholders over some reasonable period of time, against the Freedom House press freedom score for their home country, then perhaps one could see whether or not there was any correlation (though not necessarily causation) between company performance and press freedom (although it is sometimes difficult to discern the true economic performance of privately held companies). In either case it is fascinating to speculate. If a free press environment helps foster superior economic performance, all other things being equal, then this makes an interesting case for the synergy between liberal democratic societies and economic vitality. On the other hand, if there is not a potential link, then perhaps it points to an interesting disconnect between freedom of political discourse and commercial results. To the extent that success in the commercial arena drives employment and other desirable things, this last scenario leads to a rather interesting question: to what extent would people trade freedom of thought and expression for economic success and creature comforts? Conversely, is one of the possibilities of the Arab Spring a relatively freer press and increased prospects for businesses both large and small?